Milo is a combination of modern form with functionality. 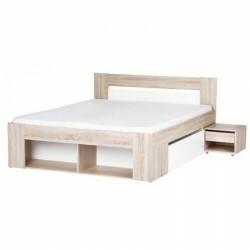 A characteristic feature of this collection is a wide, comfortable bed with two pull-out bedside cabinets and drawers. 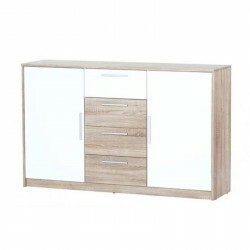 Extremely spacious wardrobe can successfully accommodate clothes of even several users. 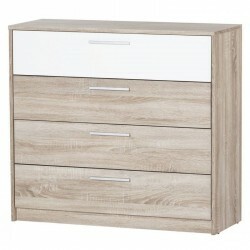 The set is completed by two functional drawers, which, together with other elements make an exceptional bedroom area. A bedroom is a place where after a hard day you can regain strength and be yourself. The Milo Collection will bring positive energy to every interior. The combination of a delicate white with an oak tree emphasizes the unique design of the structures. Do you want to arrange a relaxing interior? The Milo collection will create a harmonious bedroom interior where you can easily regain strength even after the hardest day. Large drawers provide ample storage space, so you can place in your bedroom everything you need to enjoy the small joys of everyday life.